Rediff.com » Movies » Katrina is the best! Katrina Kaif is clicked in various poses during the announcement of the nominees for the 55th Filmfare Awards in Mumbai on Wednesday. Katrina bagged a Best Actor nomination for her role in New York. She will also perform at the award function to be held on February 27 at Mumbai's Yash Raj Studios. Mugdha Godse strikes a pose during a fashion show. The actor walked the ramp in outfits designed by fashion designer Archana Kochar. The show's proceeds will go to Deeds, a charity working for the hearing impaired. 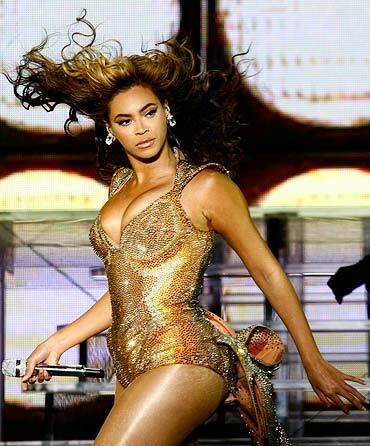 Beyonce performs during a concert in Lima, Peru on Tuesday. 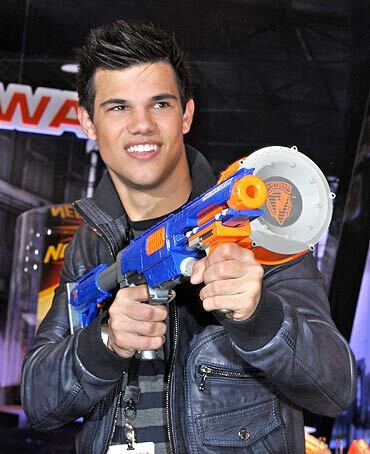 Twilight actor Taylor Lautner, who will be seen in the upcoming superhero adventure film Stretch Armstrong from Universal Pictures and Hasbro, tries the 'Nerf Raider' blaster as he visits Hasbro's showroom at the American International Toy Fair in New York. Brooke Shields attends the Pamella Roland Fall 2010 collection during New York Fashion Week. Julianne Moore arrives for the screening of the movie The Kids Are All Right at the ongoing 60th Berlinale International Film Festival in Berlin. Look who is turning 40!